In the case of the iPhone, the 3G was clearly better than the 1st iPhone (enclosure notwithstanding), as was the 3GS relative to the 3G, and the 4 to the 3GS. Ultimately, Apple feels it was the iPhone 5 that is “good enough,” as seen by their willingness to finally make a mid-range version…the line has been set; clearly we won’t see a truly low-priced iPhone until Apple can include iPhone 5-level technology at a price they are comfortable with. So that’s reason number one that the iPhone 5C is $550. Apple is focused on product-quality first, price second. However, even if Apple had decided they could make a phone for less, it still wouldn’t have been a good idea for two additional reasons. I combined carrier ARPU by country with browser share data from StatCounter. Countries are ordered by ARPU. iPhone browsing share is correlated to carrier ARPU. Click for larger version. I find this very illuminative. If we assume ARPU is a good proxy for subsidization, then this strongly supports the idea that the iPhone is highly competitive1 versus Android in subsidized markets (the left side), but is simply too expensive in non-subsidized markets (the right side). The right side of this chart is the visual case for a low-cost iPhone. The chart was useful, but my conclusion was totally wrong. I didn’t really think through the implications of there being three iPhone markets. The first iPhone market is the extreme left: Canada, Japan, and the US. These markets disguise the true cost of an iPhone – you pay the same (high) contract rate no matter which phone you choose. Unsurprisingly, the iPhone is very successful here. For the sake of simplicity I’m going to call this the American-style market. The second iPhone market is the rest of the left side (mostly Europe – again, for simplicity’s sake, I’m calling it European-style). These markets provide a subsidy along with contract rates that change with the price of the phone – it’s much clearer the iPhone is more expensive, although you don’t necessarily pay a large amount up front. In other words, if you get an iPhone, you’re paying more per month than you are for a very fine Android phone. The third iPhone market is on the right side of the chart, and while European-style subsidies may be available, most consumers pay full price for the phone in a separate transaction from their mobile contract, or, more likely, their prepaid fill-up. I’m going to call this the Asian-style model (most of Asia fits here, but Japan and South Korea are notable exceptions). Looking again at that chart, and with the realities of these three markets in mind, it’s not so much that the iPhone has saturated the American-style and European-style markets, and ought to focus on the Asian-style one; rather, the iPhone has saturated the high end in all three markets – the high end just varies in accessibility ($200 for American-style, $650 for Asian-style). And, if you accept that the iPhone is in roughly the same competitive position in all three markets – that the difference in market share is due to inherent structure of the market – then it’s not at all obvious Apple should focus on the SE Asia-style market. In fact, it’s obvious they shouldn’t. While any discussion about the iPhone touches on subsidies, the subsidies themselves – and the degree to which the iPhone is accessible – are much more a function of the underlying economy. Countries to the left are more service-oriented, and have higher purchasing power. There is much higher credit-card penetration, and, generally speaking, greater respect for copyright. All of these factors make the left side of that chart much more attractive to Apple. Apple’s ecosystem and overall value prop is certainly the highest in the United States for all of the factors just listed, and the value-add of their ecosystem roughly tracks the same left-to-right listing of countries in the chart above. From Distimo. Click the image for the original article. The fact the 5C needs to be sold in both subsidized and unsubsidized markets makes the pricing tricky; in [American-style] subsidized markets, Apple is currently receiving a subsidy of around $450 on the iPhone 5. It wouldn’t make sense to unilaterally lower that – after all, it’s not like the carriers are going to lower iPhone service bills. This sets a floor of $450 for the unsubsidized 5C ($0 with contract). This also lets Apple dump the 4S, with its 3.5″ screen, 30-pin connector, and lack of LTE. $99, however, implies an unsubsidized cost of $550. Therefore, it’s very rational for Apple to optimize its pricing for the American-style markets, and the most logical price is $550/$99. The most elementary thing to understand about pricing is the demand curve. In general, and as one might expect, the quantity sold has an inverse correlation to price. 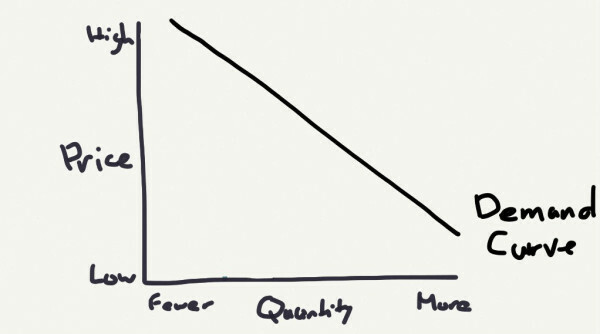 Basic demand curve; as the price drops, the quantity sold increases. Click the image for the original article. The amount to which price influences quantity – i.e. the slope of the line – is the product’s elasticity. 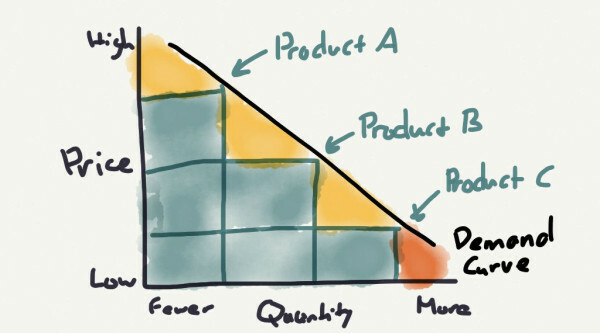 If reducing the price of a product by 10% results in 10% more being sold, then the product has an elasticity of 1. If a 10% reduction results in 15% more being sold, then the elasticity is 1.5. With an elasticity of 1, having a price of $450 would result in 22 more units over the 100 unit baseline, but lower profits overall. An elasticity of 1.5, on the other hand, results in more profits at the $450 price point. It’s not at all certain the iPhone will stop at two new models a year. In fact, I wouldn’t be surprised if 2014 brought a $450 5C 2nd generation, with all new colors. Now you’re optimizing for three different points on the demand curve instead of undershooting on the low end and leaving money on the table. To summarize, Apple’s decisions with the 5C are completely rational. There are two risks in this approach, both having to do with apps. The first is losing the “new and shiny” app advantage. 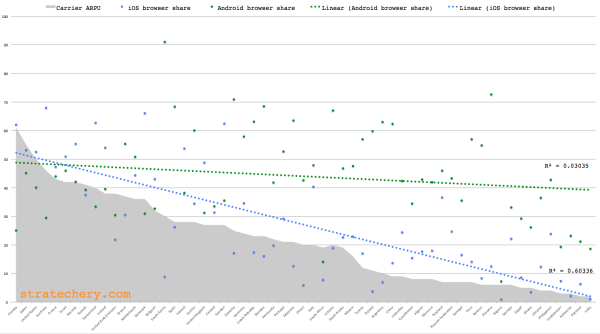 Incremental change will only slightly slow Android’s expansion, and while much of that expansion has low engagement, low engagement/user x many more users still equals more total engagement. Were, based on this equation, new apps and features to start coming to Android first, Apple would lose a major differentiator. However, I think this risk is a small one. The 5C will solidify Apple’s hold on the United States, where just under 50% of app developers live. 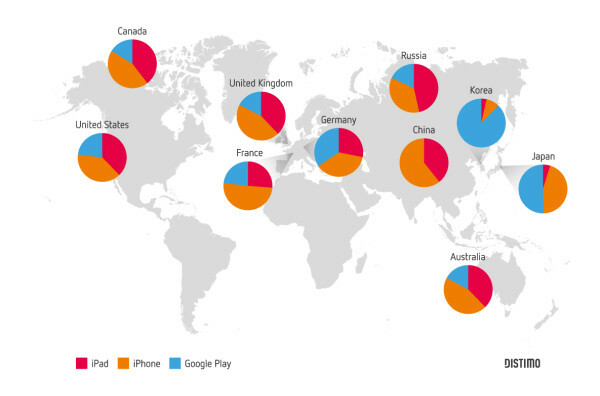 Moreover, the 5C is focused on those blue pie slices – the Android users who are driving engagement. The other risk, though, is more localized. Specifically, iOS is on the verge of being a complete non-factor in several countries on the right side of that chart. In India, for example, iOS penetration is minuscule, meaning the local app advantage tilts towards Android. China is another significant market on the right side, although Apple enjoys such brand prestige that they are probably safer for now. Regardless, missing out on the fastest-growing markets is absolutely a concern. Ultimately, though, the $550 5C is very rational and a decision I now agree with.